Exciting Announcement! – The Small Things. I am so thrilled to share some super exciting news! Today, I signed up to run in my first ever 5K race! This is big news because I’ve never done anything like this before and also because it is one of my new years resolutions. Now that I have put down some money and registered, I know that I will be more motivated to train. I am not the type of person who does things half-assed. If I am going to put my time, money and energy into anything, I am going to do it right! I’m not saying I’ll be the fastest or the best but I am going to set some personal goals and I am determined to meet them. 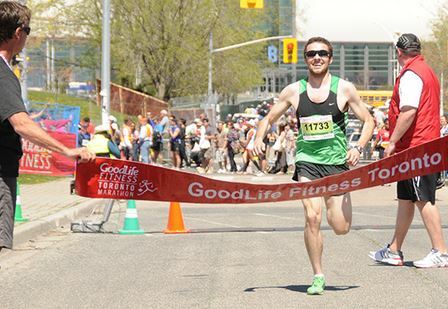 The race I am participating in is the Goodlife Fitness Toronto Marathon – 5 K Run. This is a massive event which will take place on Sunday, May 3rd, 2015. There is a marathon, a half-marathon, a 5K run and a 5K walk. I think it will be quite nice. Early May means it wont be too hot and the route is right along the Toronto waterfront. I think my biggest challenge will be moving from indoor running to outdoor running. Usually when I run (which is less often than I’d like to admit) I run inside on a treadmill at the gym. Can you blame me? Canadian winters are quite brutal. No joke, its negative 17 with the windchill right now. Also, I have mild asthma so heavy breathing in extreme temperatures is not doctor recommended. So generally I stay indoors. The challenge is that running on a treadmill and running on pavement is very different because the treadmill helps to propel your weight forward, whereas your all on your own in outdoor running. My plan is to do lots of interval and long distance training on the treadmill and when the temperatures improve in the early spring I’ll hit the great outdoors. Some of my friends may join me and participate in the race as well and Lucas has promised to come cheer me on. I am so excited for this upcoming journey! Stay tuned for updates on my training! Have you ever participated in a 5K? What did your training program look like?